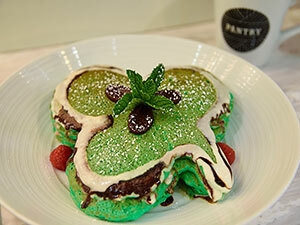 Green, shamrock-shaped pancakes for breakfast make a fun start to St. Patrick’s Day. Mint and basil go into the batter, adding the signature color as well as flavor. 1. In large bowl, mix all ingredients to prepare griddle cake mixture. Do not over-mix; leave lumpy. 2. Pour batter on oiled griddle. With spoon or small scoop, create clover leaf design on griddle, or use a clover leaf stencil. Wait till bubbles form, about 3-4 minutes, and flip. 4. Garnish or decorate with vanilla mascarpone and chocolate sauce. Finish with fresh mint leaves.